I see that coffee chain Starbucks and the sandwich empire Pret a Manger are planning to sell alcohol in their stores throughout the UK, in a bid to attract evening drinkers away from pubs. Both of these well know firms have already trialled selling wine, beer and evening meals during late opening hours at some of its main outlets in London. But now they have announced that they are looking at opening more new stores and offering alcohol at existing locations. 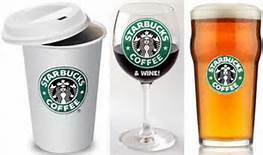 Starbucks new look shop, called 'Star R', opened in October and offers wine, craft beer and tapas after 4pm each day. Unlike its normal stores, the London branch in Covent Garden (below) has table service from uniformed waiters with iPads. Starbucks boss Howard Schultz has said that he wants to open up to 100 of the Star R branches around the world. I understand that these new locations will include more London outlets, as well as Birmingham (great for me! ), Manchester and Bristol. 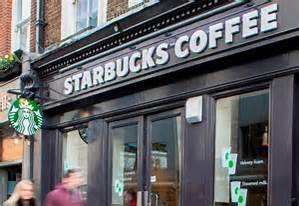 The vice president for Starbuck's European operations has said they are finding customers want to come to the store in the evening as an alternative to the pub. 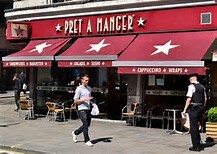 Meanwhile, rival Pret a Manger's trial store opened on the Strand in London (below) last April, and aims to tempt theatre-goers with meals and alcohol served to customer's tables. Nick Sandler, Pret's creative chef is reported to have commented that customers have been asking for some time about an early evening menu. So which is it, a latte or a lager?